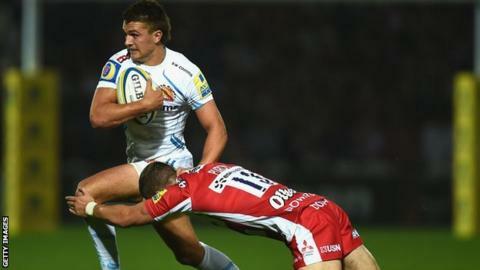 Exeter Chiefs back Henry Slade has signed a new long-term contract with the Premiership club. The 21-year-old, who made his Chiefs debut in 2012, played for an England XV against the Barbarians in June. "We've known for a long time that he's a good player and we keep telling everyone that he's a good player," Chiefs director of rugby Rob Baxter told BBC Radio 5 live. "I'm delighted we've got all our young players signed up." Slade kicked a long-range penalty in Exeter's 25-22 win at Gloucester on Friday and is a candidate for the England elite player squad, which will be named in October ahead of the autumn internationals. "He's going to be staying at the club long term," added Baxter. "There's not been an issue with him staying, but there's been some paperwork to sort."